The virgin Nina (or Nino) of Cappadocia was a relative of Great-martyr George and the only daughter of a widely respected and honorable couple. Her father was a Roman army chief by the name of Zabulon, and her mother, Sosana, was the sister of Patriarch Juvenal of Jerusalem. 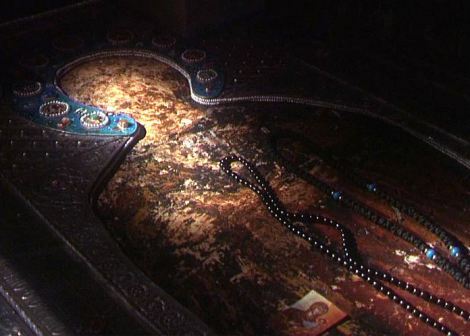 When Nina reached the age of twelve, her parents sold all their possessions and moved to Jerusalem. Soon after, Nina’s father was tonsured a monk. He bid farewell to his family and went to labor in the wilderness of the Jordan. After Sosana had been separated from her husband, Patriarch Juvenal ordained her a deaconess. She left her daughter Nina in the care of an old woman, Sara Niaphor, who raised her in the Christian Faith and related to her the stories of Christ’s life and His suffering on earth. It was from Sara that Nina learned how Christ’s Robe had arrived in Georgia, a country of pagans. When Nina arrived in Rome, she met and baptized the princess Rhipsimia and her nurse, Gaiana. At that time the Roman emperor was Diocletian, a ruler infamous for persecuting Christians. Diocletian (284–305) fell in love with Rhipsimia and resolved to marry her, but St. Nina, Rhipsimia, Gaiana, and fifty other virgins escaped to Armenia. The furious Diocletian ordered his soldiers to follow them and sent a messenger to Tiridates, the Armenian king (286–344), to put him on guard. King Tiridates located the women and, following Diocletian’s example, was charmed by Rhipsimia’s beauty and resolved to marry her. But St. Rhipsimia would not consent to wed him, and in his rage the king had her tortured to death with Gaiana and the fifty other virgins. St. Nina, however, was being prepared for a different, greater task, and she succeeded in escaping King Tiridates’ persecutions by hiding among some rose bushes. 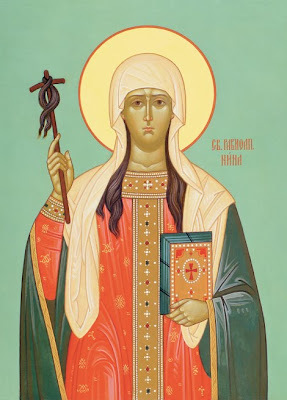 When she finally arrived in Georgia, St. Nina was greeted by a group of Mtskhetan shepherds near Lake Paravani, and she received a blessing from God to preach to the pagans of this region. St. Nina made her home beneath a bramble bush in the garden of the king, with the family of the royal gardener. The gardener and his wife were childless, but through St. Nina’s prayers God granted them a child. The couple rejoiced exceedingly, declared Christ to be the True God, and became disciples of St. Nina. Wherever St. Nina went, those who heard her preach converted to the Christian Faith in great numbers. St. Nina even healed the terminally ill Queen Nana after she declared Christ to be the True God. 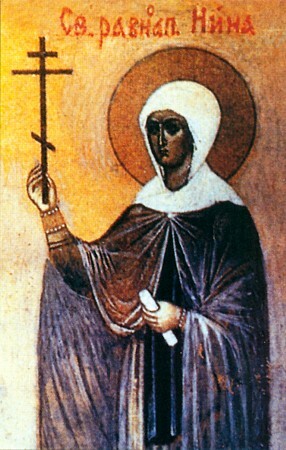 King Mirian, a pagan, was not at all pleased with the great impression St. Nina’s preaching had made on the Georgian nation. One day while he was out hunting, he resolved to kill all those who followed Christ. Suddenly the night was transfigured, the sun shone radiantly, and King Mirian gave great thanks to the Creator. When he returned to the city, he immediately informed St. Nina of his decision. As a result of the unceasing labors of Equal-to-the-Apostles Nina, Georgia was established as a nation solidly rooted in the Christian Faith. 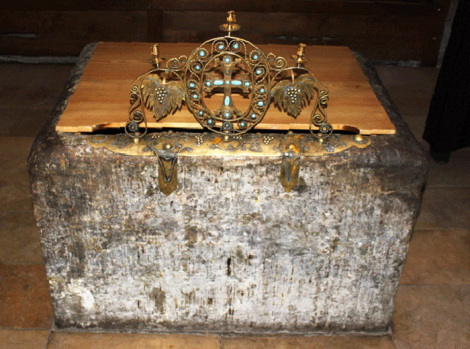 St. Nina reposed in the village of Bodbe in eastern Georgia and, according to her will, she was buried in the place where she took her last breath. 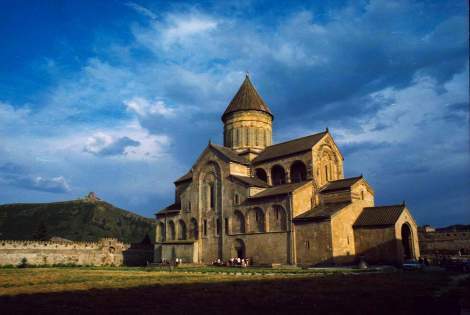 King Mirian later erected a church in honor of St. George over her grave. 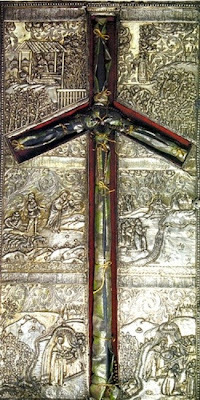 O handmaiden of the Word of God, who in preaching equaled the first-called Apostle Andrew, and imitated the other Apostles, enlightener of Iberia and reed pipe of the Holy Spirit, holy Nina, equal of the Apostles, pray to Christ God to save our souls. 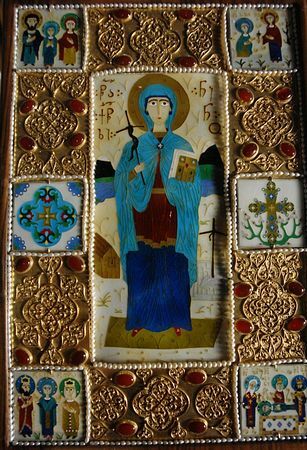 Let us sing praises to the chosen of Christ, Equal-to-the-Apostles and preacher of Gods word, the bearer of good tidings who brought the people of Georgia to the path of life and truth, the disciple of the Mother of God, our zealous intercessor and unwearing guardian, the most praised Nina.